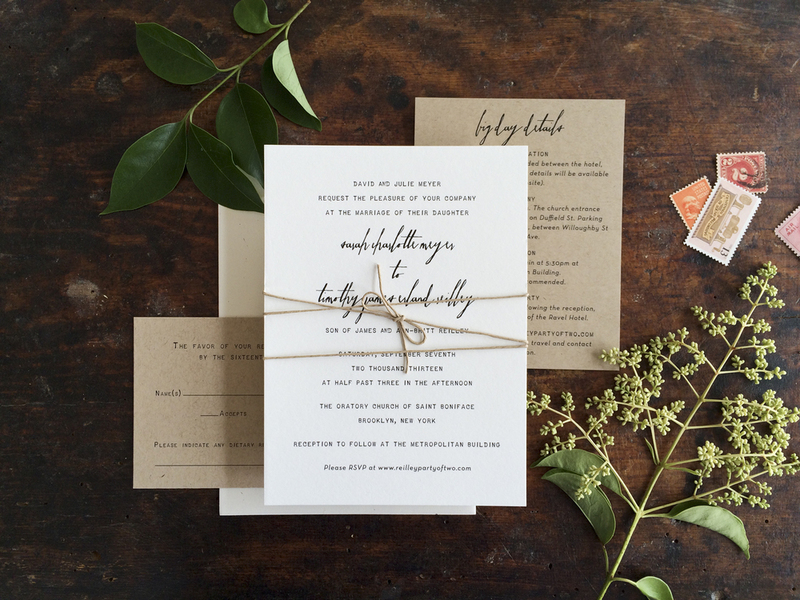 Our Simplicity wedding invitation suite is anything but showy. Kraft, white, and twine keep this suite down to earth, and ideal for a variety of events, from barn weddings to beach weddings. Typewriter fonts and calligraphy-inspired script make it special. What's not to love about Simplicity? Check our instagram for variations! Make it Yours: Simplicity is like a blank slate. Change the fonts to something more traditional, and you've got a completely different invitation! It looks great in all printing methods: flat, letterpress, and foil. For a less rustic look, replace the twine with cotton or silk ribbon. Add even more personality with your favorite envelope liner. Colored papers and envelopes are a possibility, and don't forget you can replace the black ink with something else... a silvery gray perhaps?